Never before in the entire technology realm has the customers been so confused when it came to making a choice for the best tablet. But now, as new and new tablets are getting launched with high end features and technologies, it has become really difficult for the consumers as to which ones to opt for and why. You can check our detailed Kindle Fire HD 8.9 Review to know more about this latest tab in detail. So, first we heard about the releasing of iPad 3 which will be lighter and thinner than the earlier models. Then, the latest on top charts is the Amazon Kindle Fire HD 8.9 inches that promises to beat iPad in no time. 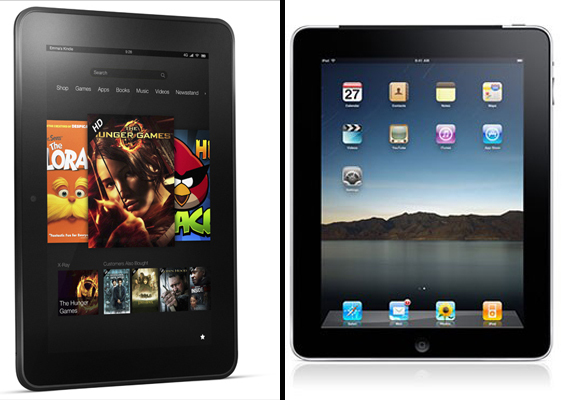 So, we can have a close and detailed look at Kindle Fire HD 8.9 vs. iPad 3 on different grounds so that we can pick the best from the two. While the Kindle Fire HD 8.9 is expected to be shipped from 20th November 2012, the iPad 3 is already all on shelves since March 16. On papers, Kindle Fire HD 8.9 surely blows iPad 3 out of water. Fire HD is lighter, thinner as well as smaller than iPad version. Fire HD has the Dolby speakers, dual stereo while iPad has the mono speaker. Then, as the iPad 3 is featured with 22Mbps 802.11n Wi-Fi, Fire HD has the MIMO antenna. The 8.9 inches Kindle Fire HD measures at 9.45 inch x 6.5 inch x 0.35 inch and has the weight of 20 oz. On the other hand, the iPad 3 has the dimensions of 9.50 inch x 7.31 inch x 0.4 inch, thereby making it skinny as well. With 23 oz weight, the iPad is a bit heavy than Amazon’s device. If you want to go after display size, then iPad 3 is the better pick. Sporting the 9.7 inches display screen, you can easily see images and text in better way, without a doubt. But to go up against Apple, Amazon has introduced the Fire HD with 8.9 inches screen that can surely change the whole game when it comes to the display screen category. As the Amazon Kindle Fire HD has Texas Instruments processor, it is called as the OMAP4 4470 and is the dual core one with 1.2GHz specs. On the other side, iPad 3 sports the dual core processor as well, but the Apple A5x one and runs at 1GHz. As far as storage is concerned, surely both Kindle Fire HD 8.9 and iPad 3 have same ones. Both the tablets have expandable memory up to 64GB which is indeed far more than sufficient. While the iPad lets you easily download the applications from App Store, Kindle Fire customers can download the applications from Amazon’s Appstore. Talking about the software, Fire HD 8.9 has the customized Android 4.0 Ice Cream Sandwich version while the iPad runs on iOS 5.1. One cannot deny that the iOS has better access to apps but Fire HD 8.9 too has access to most important apps out there like Skype, HBO Go, Angry Birds and Netflix to name a few. As far as camera capability is talked of, Kindle Fire HD 8.9 is the sure shot winner. With HD front facing camera, it is great. The iPad has VGA front facing camera that is not good at all. But in case you are looking forward to have the camera at rear side also, consider taking iPad as it has the 5 MP camera. This is the most important category that every customer is interested in. while the Kindle Fire HD 8.9 starts with just $299, it goes up to $599. This is definitely more value for the money spent. On the flip side, Apple iPad 3 starts from $499 and goes up to $829 (which is surely a bit expensive). It is really interesting to watch how Apple reacts to Kindle Fire HD, but if you want to have a cheap tablet with all top features and amazing specs, then going for Amazon Kindle Fire HD 8.9 will be a great decision.